After a month-long investigation into a suspicious fire at a Palm Bay, FL car dealership, police arrested a 36-year-old man on multiple charges. According to officials, the fire gutted the business, but not surveillance cameras caught the man stealing a Ford Ranger and driving away. Florida Today reported that, shortly after the fire in July 2017, officials considered the accused a person of interest and issued a warrant to question in connection with the incident. Even after the arrest for grand theft of a motor vehicle, burglary of an unoccupied conveyance, and a failure to appear charge, the investigation into the fire continues. Florida burglary laws can be confusing because various circumstances can lead to different types of crimes. An experienced criminal defense attorney can help explain more about the specific crime of burglary of an unoccupied conveyance. Lawfully enters someone else’s structure or conveyance, and remains there after permission is withdrawn, with the intent to commit an offense while inside. With burglary crimes, the structure can be a building of any kind, whether temporary or permanent; all accompanying property is included in the definition. A conveyance is any car, truck, boat, vessel, recreational vehicle, and similar vehicles. 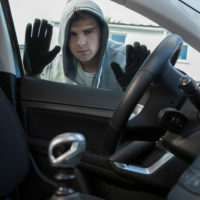 Burglary is always a felony, but the nature of the offense depends upon the circumstances of the crime. First Degree Felony: If a person commits assault or battery, is armed with a dangerous weapon, or uses a motor vehicle in connection with the offense, the charge is a first degree felony. In addition, you may be charged with this type of felony if you cause damage in excess of $1,000. A conviction may lead to a sentence of life in prison. Second Degree Felony: The charge is a second degree felony if there is a person in the structure or conveyance when you commit burglary. If you enter or remain in a dwelling, regardless of whether someone is present, you will also face second degree felony charges. The potential penalties include up to 15 years in prison, 15 years on probation, and a maximum fine of $10,000. Third Degree Felony: If you enter or remain at a structure or conveyance when no other person is present, the charge is a third degree felony punishable by five years in prison and a $5,000 fine. Regardless of the nature of the circumstances, Florida punishes all burglary crimes harshly. Still, you are entitled to your day in court to challenge the allegations and fight the charges. With an experienced criminal lawyer on your side, you can develop a strong defense strategy to obtain the best possible outcome in your case. Attorney Kevin J. Kulik serves clients in Fort Lauderdale and throughout the Broward County area, defending all types of criminal cases. Please contact our office today with questions or to set up a confidential consultation.